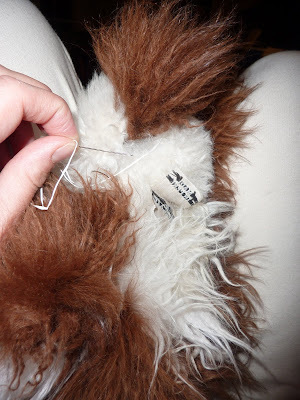 This is my third mending of Emmett's beloved bear. We are trying to avoid this turing into a "hide" like the last bear. Unfortunately the leather begins to get brittle. But Emmett, your mother will continue to sew up your bear with dental floss as long as I can. It is worth the light up, and love in your eyes. You can be truly grateful for the simple things. That's so sweet. Call me sometime this next week so we can catch up!